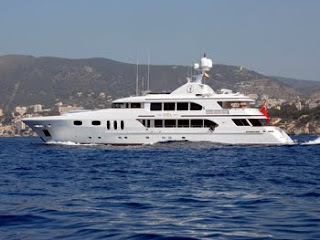 After a major refit in 2007, the 150' Luxury Yacht Vita built in 2003 by Trinity Yachts is now available in the Mediterranean for charter. 10-12 guests, 5 staterooms. The two additional Pullman berths are available for small children only. As you enter the master stateroom forward of the main foyer on deck, your first entry includes a intimate lounging area with 32” Sony Bravia LCD flat screen TV behind a Visionart Screen. This area also includes two Sub Zero refrigerated drawers. Continuing forward, the hallway leads to a king size bed framed in hand-carved walnut and burl, dominating the center of the full-beam master stateroom. The stateroom benefits from a 38“ Hitachi flat screen TV recessed opposite the bed, behind walnut cabinetry, and a large desk area with computer and VSAT internet. The master stateroom encompasses two walk-in closets. Private bathrooms with exquisite stonework in masculine and feminine hues adorns the bathroom counters, floors, and back splashes and have an adjoining shower with steam options. The ladies bathroom includes a relaxing Jacuzzi tub, bidet, and a vanity with large mirrored panels. Lighting in the master can be controlled and dimmed through different locations including the bedside tables. At the foot of the intricately carved spiral stairway lie four guest staterooms. There is a central guest lobby complete with two Sub Zero refrigerated drawers. Forward to port: King Stateroom, with Pullman berth. Full entertainment system with 26” Sony Bravia TV. En-suite features head, sink, and shower. Forward to starboard: Twin Stateroom, with Pullman berth. Full entertainment system with 22” Panasonic TV, including Playstation 3. En-suite features head, sink and shower. Midships to port: King Stateroom, with 26” Sony Bravia TV and full entertainment system. Ensuite features twin sinks, head and spacious shower. Midships to starboard: King Stateroom with 26” Sony Bravia TV and full entertainment system. Ensuite features twin sinks, head and Jacuzzi tub with shower overhead. The guest staterooms and ensuite bathrooms are trimmed with exotic stone, including Arabescato Fantastico, Blue Oyster, Light Emperadore marble, and Tiger Onyx. The port and starboard forward staterooms were specially refitted to accommodate children with the addition of a Pullman berth in each cabin. Each stateroom has a large, hanging locker lined with cedar which includes safety equipment as well as a separate digital temperature control and complete audio/visual equipment. From the Crestron control panel you are able to access a music library, video server, Satellite TV, internet and light settings. Click here for more photos and information on charter availability.